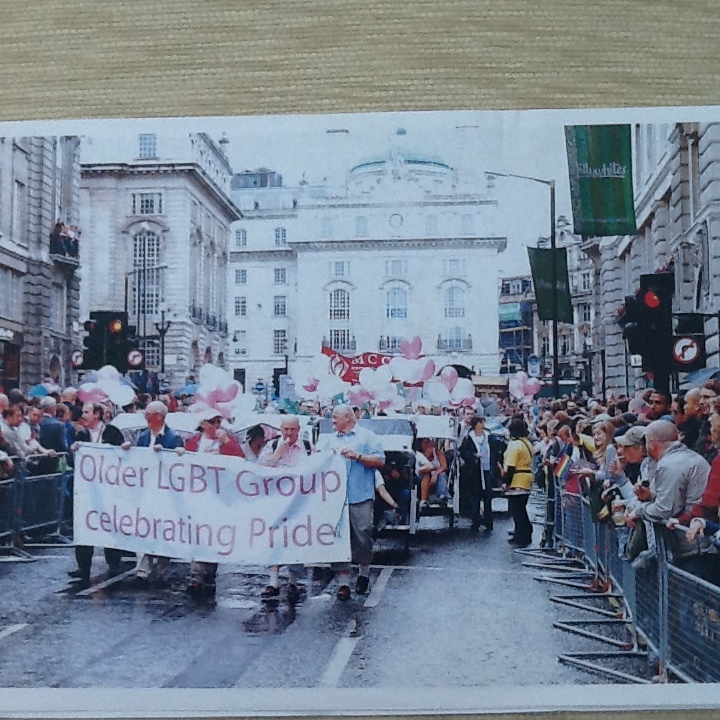 From the mid 90’s onwards gay pride became one of the focal points of my year. There was Christmas, there was New Year, there was the end of term, but for me Gay Pride was where it all happened. I remember that first time I saw it taking place. No I didn’t join in. I just stood there, on the pavement, transfixed, while I watched this very ordinary crowd of people walk past me. They were largely people in their 20’s and they were purposeful and knew exactly what they were doing. I remember being struck by the sight of a man in his 40’s with a folded copy of the Times, under his arm, silently walking almost as if he had chanced on the march after collecting his Saturday paper, and the march happened to be on his route walking home. And I remember being so taken up with the whole event that I thought ‘oh bugger it!’ and I started to clap. This meant I was becoming an activist, though, to be honest, once this small parade had passed, I very quickly disappeared safely down the steps into the anonymity of the underground station. From then Pride became an unmissable event and soon a whole group of us were doing the journey from Margate in order to take part. Like thousands of others, from all over the country we converged on London for that weekend very definitely wanting to exclaim that ‘gay was good and gay was proud’. Most other cities had yet to have their own Pride and so to be in the capital in great numbers was important to us to create that sense of power when protesting for our rights. It is hard to believe that this blog would have a section about the routes which the marches took, but they had political significance and mark the progress of our journey from rejection to acceptance. My experience began with the early marches starting on the Victoria Embankment, and I liked to arrive early, if only to take in the excitement of seeing just a handful of marchers steadily growing to become a huge group of people, and then we were off. We were allowed to march through Trafalgar Square but that was the only place where spectators, in large numbers, actually saw us. The police had very cannily ensured that our route would have the least exposure possible, and so we wound along deserted Pall Mall, eventually reaching the less populated part of Piccadilly and then from Hyde Park Corner straight into the Park. Eventually Whitehall was allowed to be included in our route and, now with our rights being granted and our status recognised, the route is probably as perfect as it could be. For a few hours the city is gay and is ours and when, not so many years ago, the manager of one underground station publicly complained that he hoped we would feel proud that they had closed his station, we just cheered and used our whistles even more powerfully, because pride was what it was all about. You couldn’t just let the day go with a mere march. The demonstration, first in Hyde Park and then, as now in Trafalgar Square became a focal event which has progressed from the political to virtually a concert. Originally the after parade events took place at Brockwell Park, then at Clapham Common, at Hackney Marshes, and lastly in Soho and Leicester Square. Big funfairs, food stalls, LGBT information stands and gay retailing were features for the thousands who attended. One can only begin to imagine the negotiation which had to take place to secure these venues, but it was important to have them. We needed to be visible whatever the constraints were to be imposed on us by the authorities and we just put up with the insufficient toilets, endless waits for transport to get us to the venue and sometimes that long long walk to get to the venue which, as in the case of the Hackney occasion, even led to some being beaten up on the way, but ‘Pride’ was about being seen, whatever the challenges. Our impressive numbers led to one rather opinionated lady saying to me “ Dont be ridiculous! There can’t possibly be as many as 5% of the country who are homosexual”. The man, who complained about so many of us being there, being told ‘now you know how we feel’. The pre gay pride breakfast hosted by one of my students, now out and proud and living with his boyfriend. The couple making their way to Hyde Park and deciding to be there because their gay son, had come out to them, wasn’t able to attend, and so were there for him. They wore T shirts proclaiming ‘We are proud of our gay son’. The gay couple, with one at his first Pride, and the other saying to him “There you are, I told you you would like it”. Sitting on the train to the after parade event at Clapham Common, packed with LGBT people and held up outside the station. “Who’s going to Clapham?” shouted one. “Only if they are very good”, shouted the reply. The carriage groans and laughs at the campery. Sitting on the grass, eating our sandwiches and suddenly being aware of two guys laying underneath one of the fairground lorries, and clearly having a good time. They finished and emerged; we applauded and shared our sandwiches with them. Our first appearance as a group of older LGBTs at the parade, being placed at the end of the parade and bursting for a pee before we had even started the walk! So how was it yesterday (June 27th 2017)? In so many ways it reflected another world compared with the 90s. A superb piece of organisation was in place. The shops were bedecked in rainbow colours. Starbucks had specially designed rainbow stickers on all their windows. Oxford Street was closed to traffic hours before the start of the parade and buses were on diversion. The crowds were there in force with one newspaper suggesting that as many as a million people might be there. The sponsorship and funding had been obtained, with Barclays obviously throwing a huge amount of money at the event and, it was so significant that, on the previous day, the USA Supreme Court had finally made a ruling legalising gay marriage. Brave new world eh? One might be tempted ask if our community needs any further political action, after all our world is a long way from the repressive days of Section 28 of Thatcher’s government and the known hypocrisy of government ministers who people on our marches knew to be secretly gay. Political statements have remained part of the parade’s agenda, not least concerning Northern Ireland’s rejection of gay marriage, and the horrendous persecution by some countries towards LGBT people. There was even a controversy about excluding a UKIP group from taking part, though they eventually managed to smuggle themselves in, at the head of the parade. There also remain issues such as homophobic violence and bullying in schools which have to be dealt with but there now exists a sort of self assurance that eventually we will prevail over every problem. So for some Pride might seem to be simply a celebration of LGBTness by those who want to do it, leaving perhaps the majority of LGBTs to get on with privately living their lives . Originally there was something unique about London Pride. It was a simple but powerful statement by many thousands of LGBT people that we were here, were queer and were not going away. The sheer force of our numbers and the noise we made mattered, and the focus was on us as individuals who had each a story to tell of coming out, of discrimination and of creating a life as an LGBT person. The Pride march was our way of affirming this, and afterwards we happily returned to our towns and cities fortified by this feeling of belonging and even committing ourselves to continue with our demands until we succeeded. Some of us, but probably very few, had LGBT organisations available to support us. A fortunate few had supportive friends to see us through and understandable then how we looked forward to the next time when Pride would give us another shot in our arms to continue with our aims. Sadly I missed that feeling yesterday. We were told that if we weren’t marching with a registered group we couldn’t take part. You couldn’t, as before, just leave the side walk and join in, and the barriers effectively enforced that separation. It is true that there were so many groups one could have joined so as to be a part of the parade but for me Pride had now become a corporate occasion, rather than a personal pilgrimage, and the result was that the parade had become available for only some LGBTs. London Pride has now become a bit like its American counterparts. Impressively organised, but rigorous in its approach, with the result that some of the spontaneity, joyfulness and outrageousness has been stifled. With the regimentation, and the over long gaps between the groups, yesterday’s parade seemed to go on forever. An engineered enthusiasm from the crowds was at times necessary when interest started to flag during the gaps. In common with a number of other spectators around me, we just gave up before the last groups had their time. The spark had been lost. We cannot go back to the Prides of earlier years but it doesn’t do any harm to ask and be clear about what the event is now really for. There is a danger that the more commercial the event becomes the more vanilla will be its power. I believe that at its root it must be always be an occasion when people are able to forcefully proclaim that ‘IT MATTERS TO BE GAY’ and that whatever fun we might derive from the occasion, it remains an intensely political event. Pride remains a wonderful experience and may it ever be so.